The first game after the break on Friday night followed a familiar script that has plagued the Yankees over the past month-plus: they dug themselves into an early hole, wasted numerous scoring chances throughout the game, and ultimately staged a late-inning rally that fell just short, resulting in yet another frustrating loss. 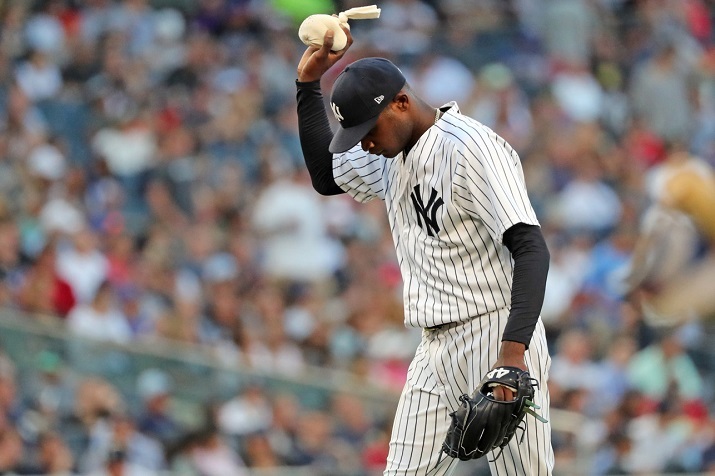 Domingo German made sure the Yankees would be playing from behind the entire night after he coughed up three runs in the first inning then another in the third before he was pulled with two outs in the fourth. Only two other Yankee starters (since 1908) have faced fewer than 20 batters, allowed at least five hits and all of them were extra-base hits in a game: the immortal Chase Wright (April 22, 2007 vs Red Sox) and Doyle Alexander (Aug. 10, 1982 vs Tigers). The Yankees survived a bizarre and chaotic ninth-inning implosion by Aroldis Chapman for a much-needed bounceback win on Saturday afternoon. After beating Mets southpaw Steven Matz, the Yankees are now an MLB-best 24-6 vs left-handed starters this season, matching their win total from all of 2017 (24-23, 12th-best in MLB). Miguel Andujar had the go-ahead hit during the Yankees big fourth-inning rally, an RBI double to give the Yankees a 2-1 lead. It was the 30th double of his career, in his 91st major-league game. The only Yankees to reach the 30-double milestone quicker than Andujar were Bob Meusel (67 games) and Joe DiMaggio (69 games). The Yankees started the ninth with a seemingly comfortable four-run lead — prior to Saturday they were 52-0 this season when taking a lead into the ninth — but that cushion was quickly cut in half thanks to an epic meltdown by Chapman. He faced five batters: walk, single, walk, walk (run scored), hit by pitch (run scored) … dugout seat. Yikes, that deserves a second Obscure Yankeemetric of the Series: Chapman is just the second Yankee reliever in the last 100 years to face at least five batters, get no outs and have at least four of those batters reach base via hit-by-pitch and/or walk. The other? Edwar Ramirez on July 20, 2007 in the fifth inning of a 14-4 loss to Tampa Bay. Even worse was his near-unprecedented lack of command, with just three of his 19 pitches going for strikes; the final 11 pitches went ball, ball, ball, ball, ball, ball, ball, ball, ball, ball, hit-by-pitch. Since 1988 (when we have reliable pitch data), only two pitchers have thrown fewer strikes in a game where they faced at least five batters: the aforementioned Ramirez disaster outing in 2007 (2 strikes, 5 batters) and Blue Jays reliever Ryan Tepera on May 11, 2016 against the Giants (2 strikes, 5 batters). So, of course, it was Chasen Shreve to the rescue! And somehow, this might have been Aaron Boone’s smartest move of the game — see our Most Remarkable Stat (MRS) below — bringing Shreve in with no outs and the bases loaded in the top of the ninth to clean up Chapman’s mess. 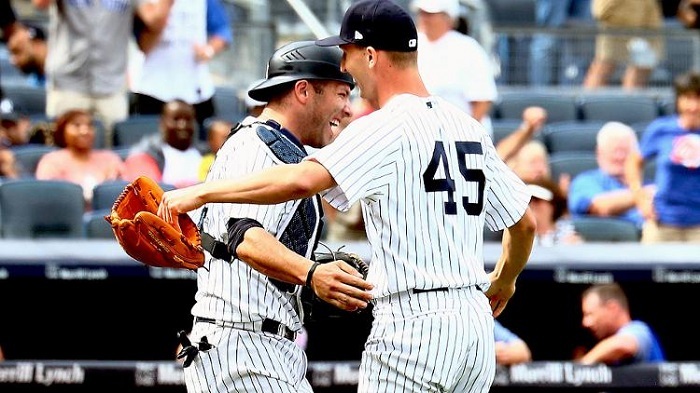 Two batters and two groundouts (including a clutch double play) later, Shreve had earned his second career save and sealed the win for the Yankees. Finally, our MRS of the Series: opponents are now 3-for-36 (.083) with the bases loaded against Shreve in his career. That’s the lowest bases-loaded batting average allowed by any active major-league pitcher who has faced at least 25 batters in that situation.